Every so often five year old Master C tells me that he’s getting too old for his wooden railway. Then he’ll usually follow that up by setting up a massive track arrangement covering every inch of the living room floor and spend hours and hours playing with it! That’s certainly what happened this week. No matter how much he enjoys more “grown up” model trains he seems to keep coming back to his Brio set again and again. His train obsession has now got past just wanting to push trains around a track and have them call at a station to pick up people or freight. Instead he’s much more interested in the actually running of the railway and what goes on behind the scenes to enable it to keep running properly. That’s why reviewing the Brio Track Repair Vehicle was just perfect for him. 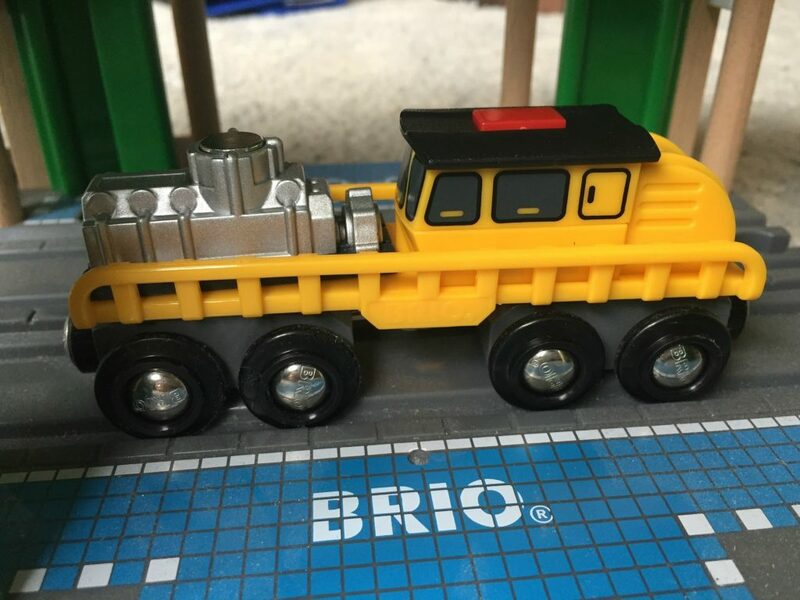 As all train addicts will know, engineering trains are usually yellow and that’s why the Brio Track Repair Vehicle passed Master C’s first test. The other thing that he loved about it was the fact that there’s a small button on the top, which when pressed give you a flickering light show underneath the vehicle to make it look like the track underneath is being welded. On the back of the vehicle is what looks like an engine block (and if I’m honest I’m not totally sure whether it’s an engine or a generator or something else) which can be lifted off. 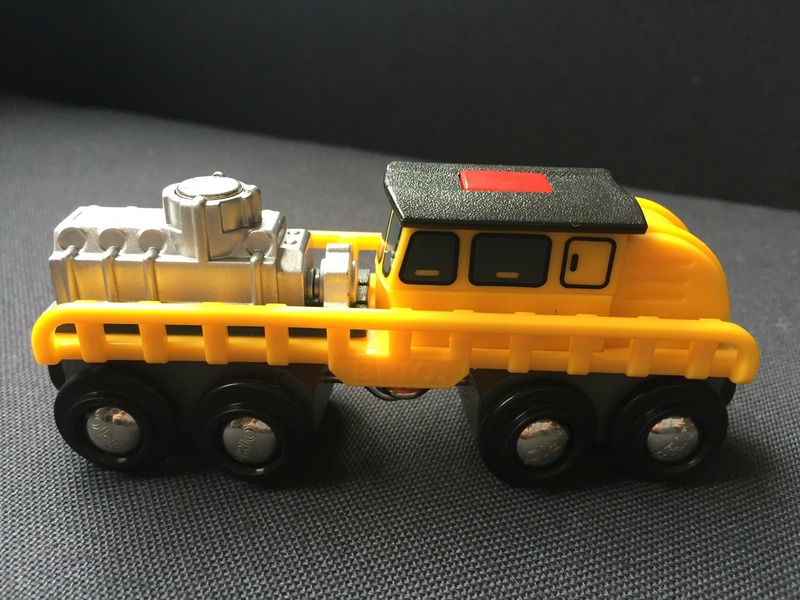 With a magnet point on top you could do so with one of the various cranes in the Brio range. As is the case with all Brio wooden railway sets everything is compatible in so many different ways. We’ve seen various engineering trains out and about on our train travels so Master C has always been keen to recreate a track scenario incorporating them in some way. He spent ages arranging track on the living room floor so that he could have a special siding to keep the track maintenance vehicle in whilst normally operations were taking place on the railway. At the right point the track repair vehicle could head out and ensure that things were fixed ready for the next day’s service. I love the Brio Track Repair Vehicle because of the way that it extends Master C’s imaginative play with his wooden railway perfectly. As I’ve come to expect with all Brio products it’s made robustly and has a quality feel about it. It’s a great extension to any child’s wooden railway network. 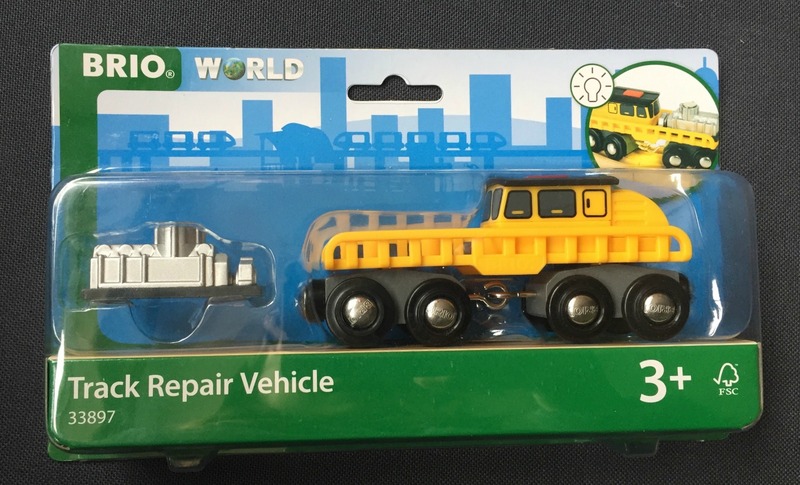 The Brio Track Repair Vehicle is available to buy online here. It has an RRP of £15.99, but may be found online for less than that. Disclaimer: We were sent the Brio Track Repair Vehicle for the purposes of this review. All opinions remain my own. This post contains affiliate links.